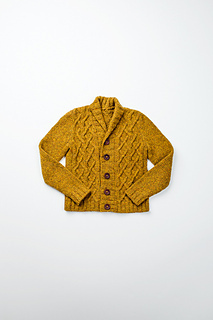 Dapper styling and a scholarly air make this cardigan at home in grand old libraries and in modern schoolyards. Knit in Shelter, Arlo features a playfully organic lattice of cables that evokes branching trees. 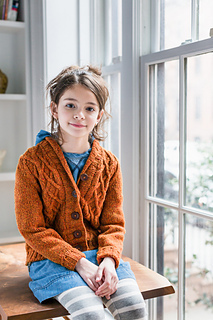 Short rows shape a fetching collar from the wide ribbed button bands and turned-back cuffs extend the life of the garment as the child grows. 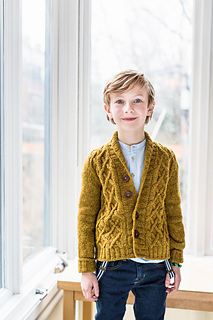 Arlo is truly unisex, but instructions are given for gender-specific button placement according to the knitter’s choice. Sewn construction provides classic polish and durability—though you may find yourself hoping for thin spots requiring suede elbow patches. Knitter’s preferred style of needle may be used. For Size B, a circular needle is mandatory and straight needles are optional.